Here is another of our favorite turkey burgers that hubby and i love to grill up on a mild spring evening. 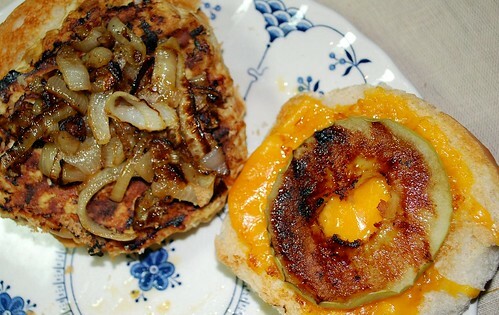 The idea for the grilled granny smiths was inspired by a Bobby Flay recipe that I came across – but we changed the cheese and added some extra flavor to the burger patties. The ingredients may sound like an odd combination but trust me, dear readers – they come together beautifully! In a medium bowl, use a fork to lightly combine the turkey meat, the olive oil, the Worcestershire, the egg, the browned onion, the salt and pepper, the garlic powder, and the poultry seasoning. Divide the meat into 4 equal parts and gently form into patties. Heat your grill to medium heat. Lightly spray the patties with cooking spray, and put them on the grill. Cook on both sides until the meat is done all the way through – it will take about 4-6 minutes per side. Meanwhile, spray the apple slices with cooking spray – grill on both sides until slightly caramelized – about 2-3 minutes per side. Broil the buns with the cheddar cheese for about 2-3 minutes, if desired. 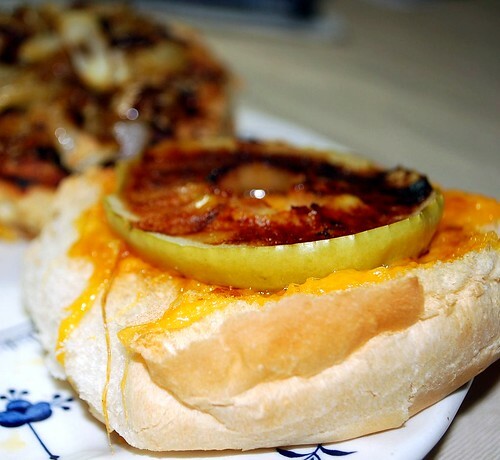 Assemble your burgers, placing the grilled apples on top of the cheese. Top your burger with more onions, if desired. Serve with your favorite sides – enjoy!